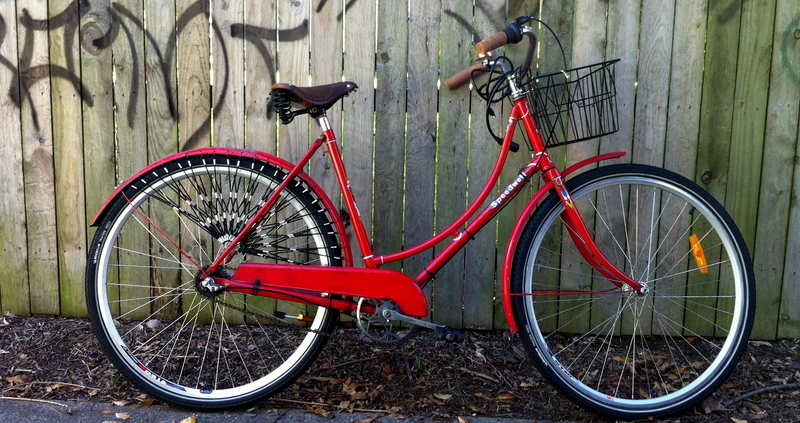 My Speedwell has evolved a lot over the nearly two years I have been riding it in its current “life”. I have covered its evolution in here and here. 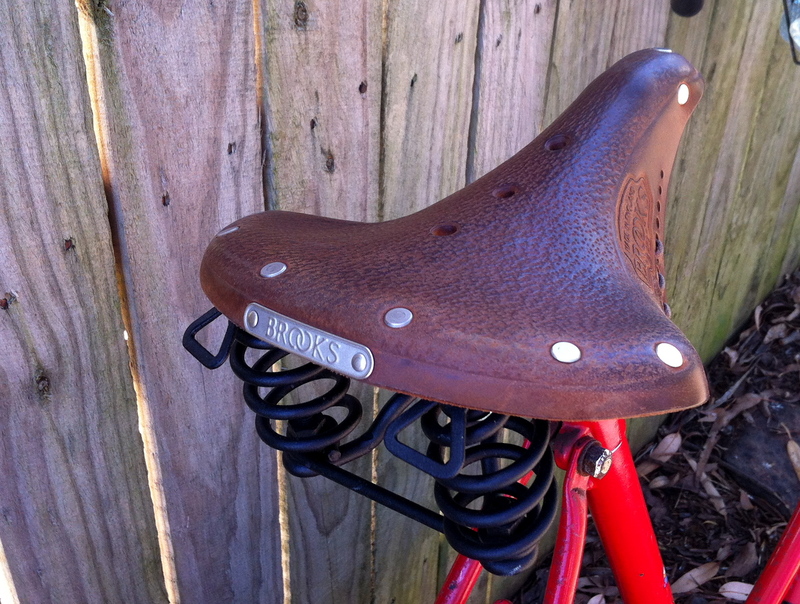 It now has an aged Brooks saddle with springs, I think it is the B67 model and I have to say that it is the most comfortable saddle I have ever ridden on, it is like sitting on a leather lounge. 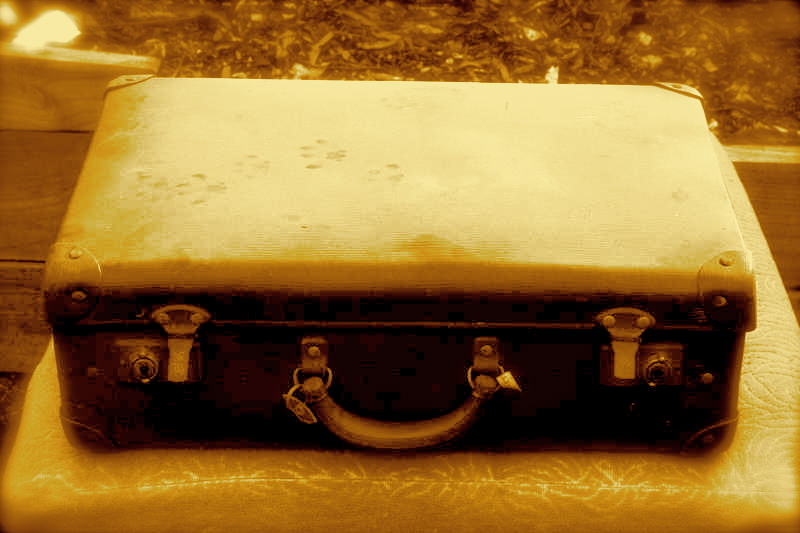 The surface of the leather has developed a soft sheen as it has aged. I haven’t treated it with any sort of leather conditioner and it has gotten wet a few times with no ill effects. At the same time I fitted it I also increased the height of the saddle tube as it was really too short and I was pedalling with my knees too bent. While riding at its current height is better (and looks more balanced with the chromed tube exposed), it has affected the braking, which is a back pedal brake. It is fine when I am actually on the bike, but when stopped I can no longer reach the ground with my feet while I am on the saddle, meaning that I have to stop the bike, then kind of jump off the saddle, landing on the ground with both feet. This does not pose a safety hazard, but it does make stopping in some situations, such as where there is uneven ground, a little awkward and I sometimes wonder how long my knees will take this kind of abuse. Similarly, as I take off, it is a little awkward sometimes as I can’t take off sitting in the saddle and have to push, start to pedal and then sit on the saddle. I thought for a while that I could fit a hand brake on the front wheel which would have mostly solved this problem, especially the stopping problem, but there is no hole in the frame to mount such a brake. The basket I am using I purchased on a whim about four years ago, at Maurice Mathe‘s, for fifteen dollars. He said many women use them as freezer baskets! I was going to use it on the Giant, but that bike has so many cables around the handlebars that the basket could not get near them, so it sat around until I resurrected the Speedwell (and before it was put into the freezer). It is almost identical to the basket I originally had on this bike, carrying my sideways-turned Globite school port in it. While this old port may look delightfully retro, they were terrible to carry many miles to school and then around the school during the day and we all had callouses on our fingers from carrying them. What would I do differently with this bike if I were repeating the journey with it? I would get better grips, the faux cork ones are wearing out. I am also not sure about the Shimano 3 speed hub as it still has problems and, looking at my blog stats, the posts about the hub problems are consistently the most searched for and viewed posts over time, so I am not the only one experiencing such problems. I could also do without the shifter and cable that come with the gears, I like the simpler look of the single speed. I would have preferred wheels that are more retro looking rather than the Vee shaped rims on these ones, but I can’t fault their performance. The skirtguard performs no useful function as I would ned to be waering a skirt that both long and very full for it to be of any use, but I love the look of it on this bike, so for me it would always be a must have. I have tried to fit a rear rack but have not been able to as there is no hole near the rear dropouts. Traditionally, the rack for this bike was fitted via the bolt that went through the rear hub, but this is all changed with the Shimano hub, it is not possible to fit it that way and I don’t want to drill a hole in the frame. Fitting looped brackets over the rear tubes would work but this set up wouldn’t be strong enough to support much weight on a rear rack so it is not worth it – a rack must be functional. I’ve written before about the ride quality of this bike, it rolls along beautifully and the step through frame and long wheel base makes it so easy, I can’t recommend such a frame too highly! That is, if you don’t mind riding an old bike. 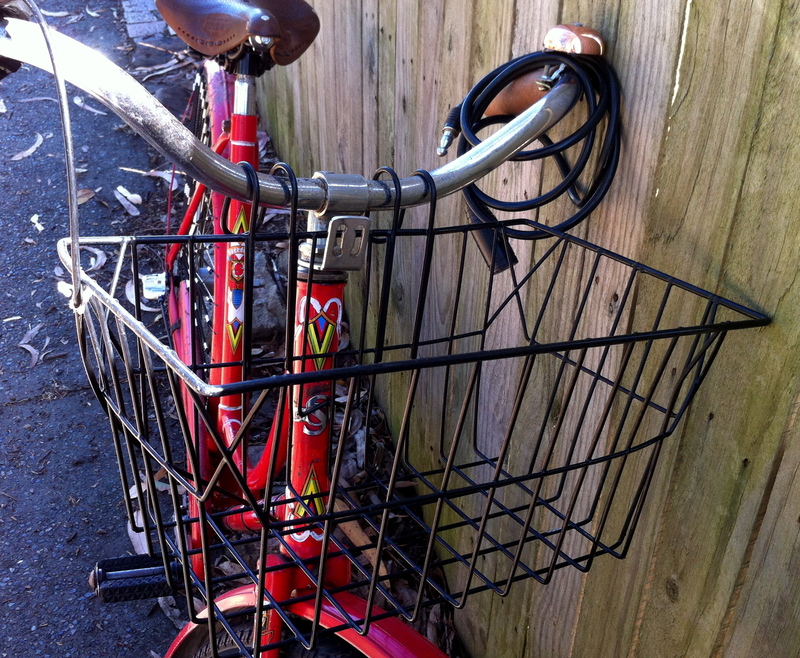 This entry was posted in Uncategorized and tagged basket, Brooks saddle, old bike, restoration, Shimano nexus 3 speed, speedwell, unusual bikes, vintage, vintage bike. Bookmark the permalink. Every time I see your Speedwell it looks better and better. Every change has been well thought out and adds character and style. 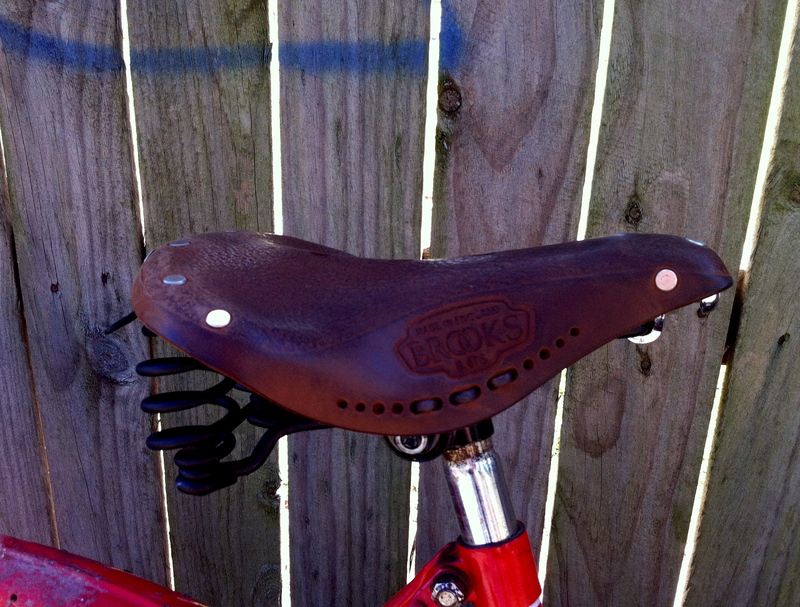 Someday I need to spring for a Brooks saddle. The front rack is splendid! I can, however, feel your pain about altering an older bike. In hindsight it sounds like it was better as a single-speed. I would look into a shorter seat post. It shouldn’t cost too much and is money well spent to position your body better for braking. I wouldn’t mess with uncomfortable posture and leg extension-not to mention, safety. If you like the looks and comfort of cork grips, check out this post by Simply Bike. These ergonomic grips are ones I’d like to eventually get and you might appreciate them also. Thanks for this link Annie. I like the grips she has used, they are better quality than the ones I have now. I agree with one of the commenters on her post that you do end up with a better bike by doing it up than when you get a cheaper modern one. I can really recommend the brooks saddle, the aged leather is really good too, I managed to pick mine up on an online sale. I still have my Globite school port in perfect condition, you can buy shorter cranks so that you can lower the seat and still not have the knees bent too far then you can touch the ground whilst still sitting on the seat when you stop.